Description: Never in my life have I had a more flavorful and robust Saison. I love saisons, especially in the Spring and Summer months. This Farmhouse-Style Saison is like no other. It has just a hint of hops, but not in an overpowering way. It is cool, refreshing and just slightly sour (also, not in an overpowering way). It has hints of clove and other spice, but is not sweet in the slightest. I love it for this food pairing. I didn’t want anything heavy for these nachos, yet I wanted a beer with a lot of flavor and oomph. This beer definitely delivers in those departments. It’s the definition of “yum” in each and every sense of the word. 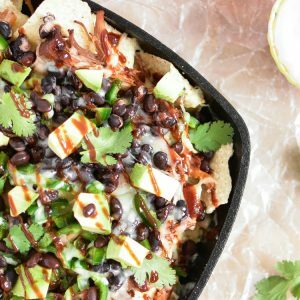 Skillet nachos are loaded up with BBQ pulled pork and are so addicting, they will be gone in minutes! In a slow cooker (set on high for 4 hours, or low for 8-10 hours), place the quartered onions. In a small bowl, whisk together the brown sugar, chili powder, garlic powder and salt. Rinse the pork shoulder and pat dry with paper towels. Rub the pork shoulder with the brown sugar mixture, coating it in it''s entirety. Place the pork shoulder into the slow cooker. Pour 1 cup of the BBQ sauce on top of the pork and cook on high for 4 hours or low for 8-10 hours. Once the pork has cooked, removed the meat from the slow cooker and shred it with 2 forks. Set aside. Preheat your oven to 400 degrees F. In an oven-safe, 12-inch skillet, place one layer of corn tortilla chips. Top the chips with 3/4 cups of pulled pork. Drizzle 2 tablespoons of the remaining 1/2 cup BBQ sauce onto the pork. Top the pork with 1/2 cup cheddar cheese and 1/2 cup of monterey jack cheese. Repeat with another layer of chips, pork, BBQ sauce and cheeses. Top the second layer of cheeses with black beans and jalapeño rings. Top with a little more cheese if you''d like. Bake the nachos for 8-10 minutes or until the cheese is melted. Remove from oven and top with additional BBQ sauce, avocado and cilantro. Serve immediately with sour cream and pico de gallo. Enjoy!